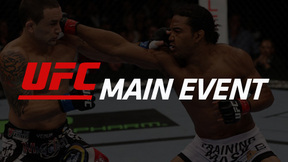 The Ultimate Fighting Championship returns to Japan for UFC 144, and the high-stakes battles on tap translate into excitement in any language. 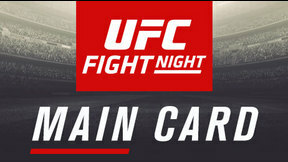 In the main event, UFC lightweight champion Frankie “The Answer” Edgar, fresh from his stirring knockout of Gray Maynard, defends his title for the fourth time against former WEC champ Ben “Smooth” Henderson, who is coming off a big win of his own over Clay Guida. 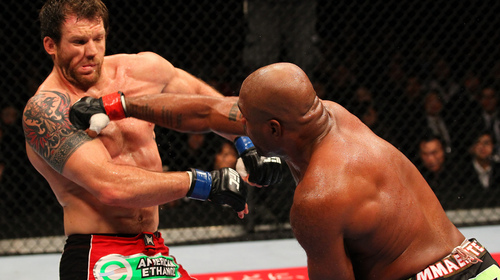 Plus, former PRIDE standout Quinton “Rampage” Jackson returns to the site of some of his greatest victories when he takes on Ryan Bader, and Japanese superstar Yoshihiro Akiyama makes his welterweight debut against submission specialist Jake Shields. 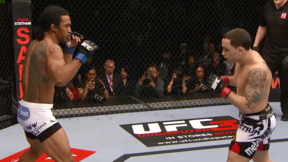 Benson Henderson vs. Frankie Edgar UFC 144 Sun, Feb 26, 2012 (44:56) Frankie Edgar and Benson Henderson put their diverse skills on display in a title fight between two of the most durable fighters in the world. Ryan Bader vs. Rampage Jackson UFC 144 Sun, Feb 26, 2012 (31:13) In a grueling fight between two hard-hitting light heavyweights, Ultimate Fighter season eight winner Ryan “Darth” Bader won a unanimous decision over former UFC light heavyweight champion Quinton “Rampage” Jackson in the UFC 144 co-main event at Saitama Super Arena. Cheick Kongo vs. Mark Hunt UFC 144 Sun, Feb 26, 2012 (13:38) Unbeaten in four fights, including wins over Barry and Mitrione, Cheick Kongo was finally hitting stride. 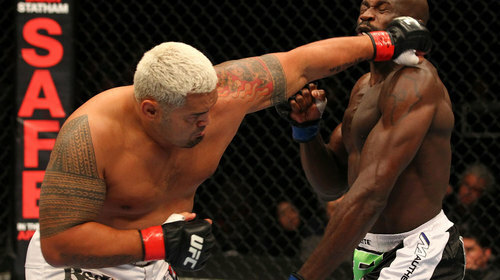 However, the same could be said for PRIDE & K-1 alumnus Mark Hunt, whose first two UFC wins against Ben Rothwell and Chris Tuchscherer were amongst the most impressive of his career. 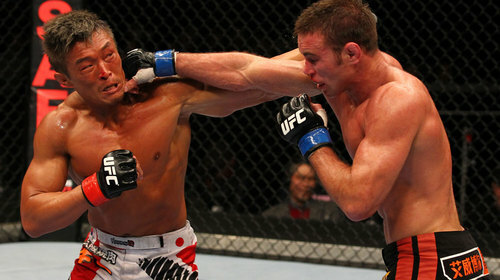 Jake Shields vs. Yoshihiro Akiyama UFC 144 Sun, Feb 26, 2012 (30:40) Yoshihiro Akiyama has shown his heart and talent with opponents who owned significant size advantages. 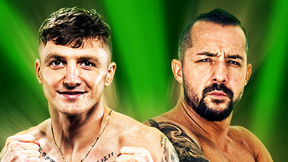 He competes on a level playing field as he drops to welterweight against Jake Shields, one of the sport’s best groundfighters and a top contender. Tim Boetsch vs. Yushin Okami UFC 144 Sun, Feb 26, 2012 (23:43) Lincolnville, Maine's Tim Boetsch was coming off two big wins against Kendall Grove and Nick Ring. At UFC 144, he took on Japan's Yushin Okami, the 'Thunder' who took on the likes of Mark Munoz and Nate Marquardt and saw victory. Hatsu Hioki vs. Bart Palaszewski UFC 144 Sun, Feb 26, 2012 (28:06) WEC veteran and ferocious puncher, Bart Palaszewski kept his reputation intact as he knocked out Tyson Griffin in less than a round. 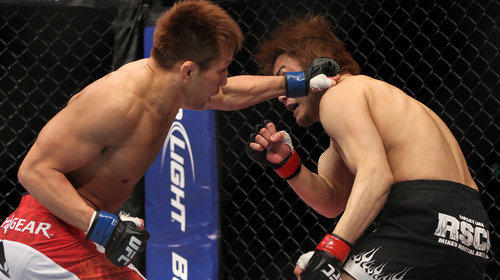 Former Shooto and Sengoku champ Hatsu Hioki successfully arrived in the UFC with a hard-fought win over George Roop. Anthony Pettis vs. Joe Lauzon UFC 144 Sun, Feb 26, 2012 (11:28) Former WEC Lightweight champion Anthony 'Showtime' Pettis took on the Brazilian Jiu-Jitsu artist from Massachusetts, Joe Lauzon. Takanori Gomi vs. Eiji Mitsuoka UFC 144 Sat, Feb 25, 2012 (22:57) Former PRIDE lightweight champ Takanori Gomi is seen by many to be the greatest lightweight fighter ever to emerge from Japan. But standing in his way is countryman Eiji Mitsuoka, a true veteran of the sport who has been competing for over a decade. Norifumi Yamamoto vs. Vaughan Lee UFC 144 Sun, Feb 26, 2012 (17:00) Kid Yamamoto’s wrestling and punching power gives him the ability to defeat any opponent who dares face him. 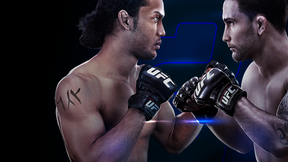 Now, submission artist Vaughan Lee has taken that challenge, but when the bell rings, only one of these competitors will earn their first UFC win. Riki Fukuda vs. Steve Cantwell UFC 144 Sun, Feb 26, 2012 (26:47) Riki Fukuda returns to the Octagon, and standing across from the seasoned competitor is former WEC light heavyweight champion Steve Cantwell, a well-rounded fighter who is looking for his first win in his new weight class of 185 pounds. 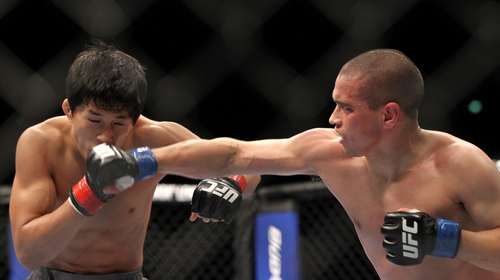 Takeya Mizugaki vs. Chris Cariaso UFC 144 Sun, Feb 26, 2012 (27:02) Shooto veteran Takeya Mizugaki left home to fight in the United States in 2009, and he has since become a top bantamweight. Now he’s back in Japan to take on another successful WEC vet, the Muy Thai specialist Chris Cariaso. Tiequan Zhang vs. Issei Tamura UFC 144 Sun, Feb 26, 2012 (15:49) A pioneer of MMA in China, Tiequan Zhang will look to add to a record that already includes 12 submission wins. 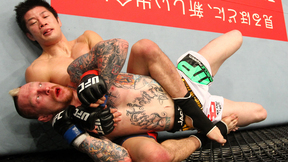 He takes on Issei Tamura, a top prospect in Japan, where he has competed in the Shooto organization, making his UFC debut.